Endodontists are dentists who specialize in maintaining teeth through endodontic therapy procedures, involving the soft inner tissue of the teeth, called the pulp. The word "endodontic" comes from "endo" meaning inside and "odont" meaning tooth. Like many medical terms, it's Greek. All dentists are trained in diagnosis and endodontic therapy, however, some teeth can be especially difficult to diagnose and treat. That’s why you may have been referred to an endodontic specialist. We will perform an examination and detailed review of your health history, your dental need and your goals. 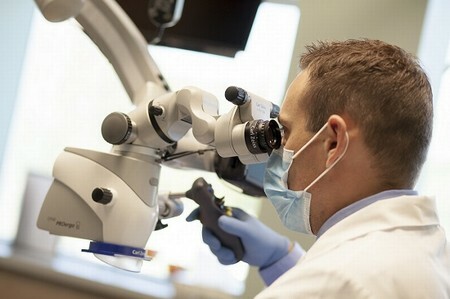 We utilize the most advanced technology, including computerized local anesthetic delivery (STA), 3-D CBCT technology and all endodontic procedures are performed under the microscope to optimize success. Your comfort is our primary priority. Our doctors will discuss your specific needs, as we believe that every patient and tooth should be treated with a customized approach. Be sure to discuss any specific needs with your doctor so we can customize your visit. Endodontic therapy is performed under local anesthetic, and sedation is available if requested. A barrier sheet called the "rubber dam" will be placed around the tooth to isolate it, hence keeping it clean and dry during treatment. The treatment consists of three or four basic steps, but the number of visits will depend on your particular case. Some treatments take 2 visits but many are just a single visit. In any case, it depends on the degree of infection/inflammation and degree of treatment difficulty. To us at Meridian, it is more important to do it the very best we can then to meet a specific time criteria. A root canal (or endodontic therapy) has a very high degree of success, normally around 95%. Only 5% can result in failure unless other prevailing factors exist such as cracks or caries. We will discuss with you the chances of success before any endodontic procedure to help you make an informed decision. If a root canal or endodontic therapy is unsuccessful, it will most likely be detected in the first 2 years after completion. In some instances, the root canal may need to be retreated, or surgically treated.